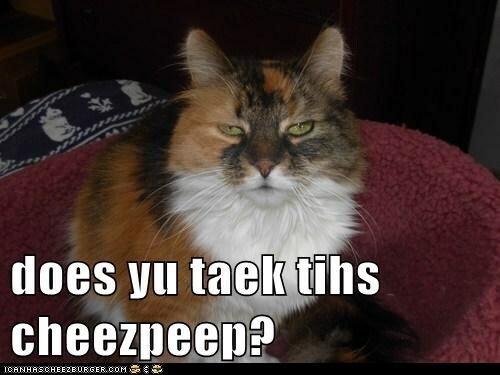 does yu taek tihs cheezpeep? A late submission to wrap up teh engagement sillybrayshuns! wait. Who is teh we? Ar yu a we or iz ai a we? Whoot — conga rats onna yer so-low nawt sekkond!! ta beez yer lawfully kontrollid slabe? Ware duz yew want me tew taik ’em? Do woo, Pwinsess Bwuttercwup, taik Pwinse Hwumperdwink……. O yah..Beta..and worse..dat wuz DOP…. It’s my bedtime cheezpeeps. Fanks eberywun foar teh fun and sillybrayshuns today.